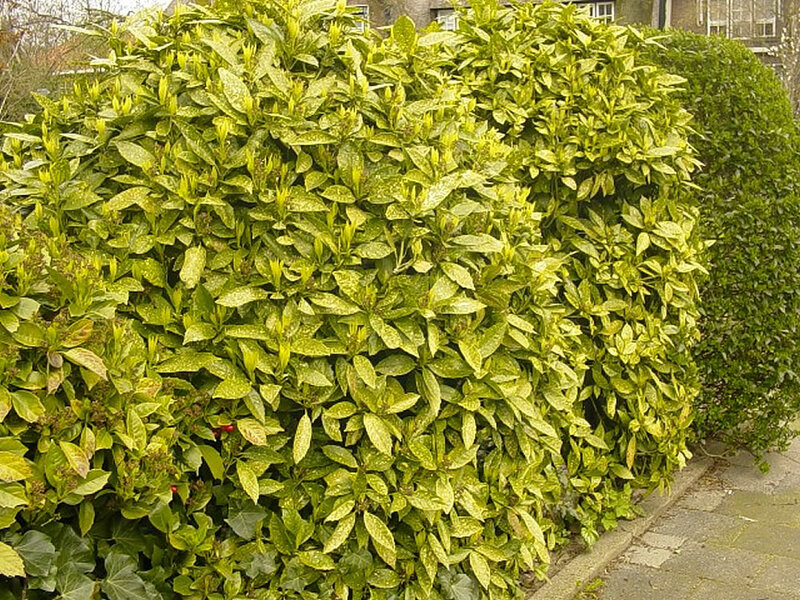 Distribution and habitat: Aucuba japonica is a dioecious evergreen shrub 1–5m (3.28-16.40 feet) high. It is native to rich forest soils of moist valleys, thickets, by streams and near shaded moist rocks in China, Korea, and Japan. Description: Although Aucuba japonica plant can reach a height of 4.5m (15 feet) outdoors, non of the several forms grown indoors is likely to grow more than 90cm (35 inch) tall. Their oval leaves are arranged in pairs, alternate on 1cm (0.4 inch) long leaf-stalk. They are 10-17cm (4-7 inch) long, glossy and coarsely toothed. They have leathery texture and green colour or attractively variegated in many cultivars on the rounded green stems. These plants form dense, upright, rounded shrub with a thicket of erect to arching shoots with limited branching. Aucuba japonica are dioecious plants which means that they have separate male and female plants, but these plants are grown for their foliage rather than flowers or fruits. The flowers are small, 4–8mm (0.15–0.31 inch) diameter, with four purplish-brown petals; they are produced in clusters of 10-30 in a loose cyme. The fruit is a red berry approximately 1cm (0.4 inch) in diameter. It matures in fall and persists till spring, but often is hidden by foliage. Houseplant care: Aucuba japonica has become a popular indoor plant. If it become inconveniently large, cut it back in early spring. Light: Indoors Aucuba japonica need bright light or filtered sunlight. Some cool, direct morning sunlight is fine. Do not move these plants outdoors unless they are provided with a cool, shady spot. Temperature: Aucuba japonica plants are particularly good for use in cold, doughty positions; they can even withstand frost. But they cannot tolerate temperatures much above 23°C (73°F). In warm rooms should be provided a high degree of humidity. Stand pots on trays of moist pebbles in order to increase humidity. Watering: Throughout the year water Aucuba japonica plentifully as often as is necessary to keep the potting mixture thoroughly moist, but never allow pots to stand in water. Feeding: Apply to Aucuba japonica plants a standard liquid fertiliser monthly throughout the year. Potting and repotting: Use a soil based potting mixture. Aucuba japonica plants thrive in relatively small pots; a 12-20cm (5-8 inch) pot gives adequate root room for quite a large plant. Small plants may be moved into pots one size larger in the spring when necessary. After maximum convenient pot size has been reached, an annual spring top-dressing is advisable. Garden: Aucuba japonica plant is valued for its ability to thrive in the most difficult of garden environments such as dry shade. It also copes with pollution and salt-laden coastal winds. This plant is a moderate grower, although faster growth can be accomplished with yearly fertilizing and regular watering until it reaches the desired size. Prune to any shape or size. Aucuba japonica will take any pruning abuse inflicted on it and keep growing back. They are low maintenance banks and slopes hedging and they form drought resistant screen. 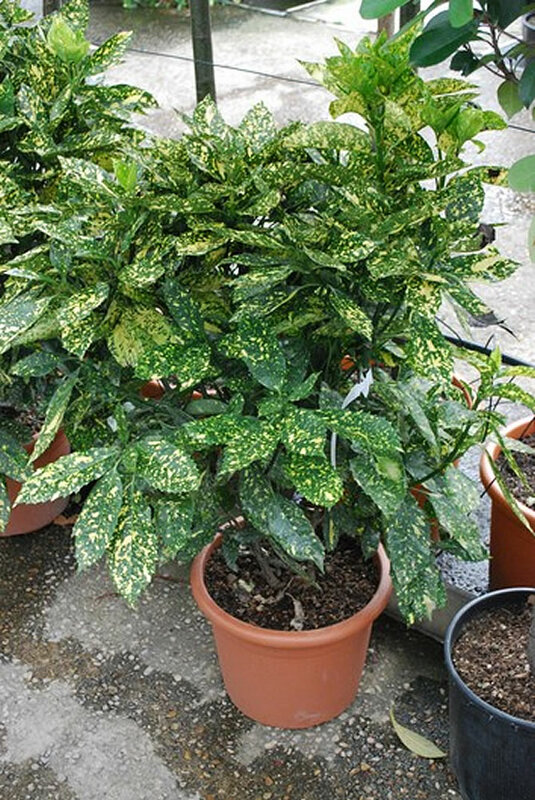 Location: Aucuba japonica plant is tolerant of full shade, pollution and salt winds. It is used in full sun to part-shade. It will do best in full shade when used in hot summer areas. It will benefit from being planted in a relatively sheltered location. Soil: Aucuba japonica is adaptable to almost any soil, except waterlogged soil. It will thrive either in loam, chalk or sand, soil which is moist but well-drained. If the soil is heavy clay, set Aucuba japonica in well-drained area in raised bed and add to the soil 1cm (0.5 inch) of pine bark. This plant is not very fussy about soil conditions but would prefer a slightly acidic to near neutral soil. In alkaline soils the plant may need supplemental fertilizing to provide nutrients not readily available under this condition. Do not plant deeper than the soil level in the container. Consider applying a thick mulch around the root zone in winter to protect it in exposed locations or colder zones. Mulch the plants but keep it about 15cm (6 inch) away from the main stem. Irrigation: Aucuba japonica does best in average to evenly moist conditions, but will not tolerate standing water. Keep the soil slightly moist at all times. Water this plants regularly always leaving the soil dry for a few days between one watering and the other. Deep irrigation every 2 to 3 weeks with one or two buckets of water. For specimens grown in a container, overwaterig should be avoided. Keep the soil evenly moist from spring through fall. Then, cut back on watering in winter when growth has slowed. 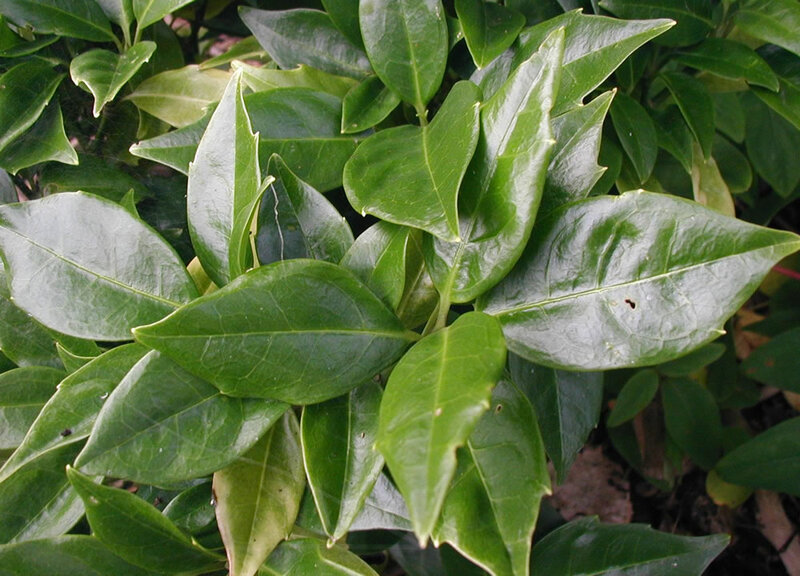 Fertiliser: Fertilise Aucuba japonica with a slow release general purpose fertiliser or a liquid seaweed emulsion fertiliser and keep well mulched to retain moisture. Fertilise only lightly, spreading it evenly over the root zone. Propagation: Cuttings 10-15cm (4-6 inch) long will root easily in spring if planted in small pots containing a moistened rooting mixture of peat moss and coarse sand or perlite. Place each pot in a plastic bag and keep it at normal room temperature in filtered sunlight, giving no additional water until new growth indicates that rooting has occurred. Thereafter, remove the plastic bag, water the young plant sparingly and begin monthly feedings of liquid fertiliser. When the plant is 30cm (12 inch) tall, move it into a 10cm (4 inch) pot of standard potting mixture and treat the plant as recommended for a mature Aucuba japonica. Problems: Wet root rot, Southern blight and fungal leaf spots may affect Aucuba japonica plants. Crown rot is caused by the soil-borne fungus Sclerotium rolfsii. This fungus attacks and kills plants at the ground level when humid conditions resulting from a tight plant canopy or debris near the stem persist. Eventually, the black decay (necrosis) may extend several centimetres upwards in the stem. Foliage of affected plants wilts and the plant dies quickly. This fungus can attack both large and small plants. Root rot of Aucuba japonica is caused by the soil-borne fungi Phytophthora cinnamomi and Phytophthora citricola. Above ground symptoms are similar to crown rot, however, the roots are usually more extensively rotted, white fungal growth and sclerotia are absent and decay may not extend as far up the stem. Diseased plants eventually die. Several nematodes cause root damage to Aucuba japonica. The root-knot nematode (Meloidogyne sp.) is the most common and causes the development of galls on the naturally thick roots. These and other nematodes reduce vigor and growth, as infected plants cannot take up water or fertilizer as well as healthy plants. A nonpathogenic root rot may also develop on Aucuba japonica growing in soil very high in organic matter and soil that is poorly drained. Excess fertilizer placed too close to the crown of the plant can also cause stem or root injury. Treatment: Because eradicating these bacterial diseases is difficult or impossible, the best recourse for infected plants is to remove and destroy them. The treatment begins with good sanitation to prevent the spread of the disease. Destroy affected plants and remove the surrounding soil and garden debris that has come in contact with them. Do not transplant any nearby plants to other parts of the garden. Quarantine new plants by growing them in a bed that is isolated from the rest of the garden until proven that they are disease-free. Do not plant Aucuba japonica were other Aucubas, Azaleas or Rhododendrons have died before. Foliage problems, such as wilting or necrotic spotting, may reflect a root problem or other stress condition. Aucuba japonica grow best in shaded areas. Plants growing in exposed areas may develop black leaf spots or blotches. A dieback characterized by total decay of leaves, petioles, and branches often occurs on exposed plants in early spring. This can be caused by exposure to full sun combined with cold injury. A weakly pathogenic fungus (Botryosphaeria sp.) is often found in such tissue and is common on many woody ornamental plants under environmental stress. Treatment: Plant Aucuba japonica in partially shaded areas. Give exposed plants some protection during cold winter weather. Promptly prune out dead branches several inches below any sign of discoloration. Avoid excess fertiliser, especially during late summer and fall. Significant dieback is often a sign that the plant may be under stress from root rot, crown rot, nematodes or other factors. Treatment: These problems are much more severe in poorly drained and waterlogged soils. Control involves improving the soil drainage wherever possible and drenching with a suitable soil fungicide. Make sure the soil crust is broken beneath the plants so the fungicide will penetrate down into the root zone of the plant. 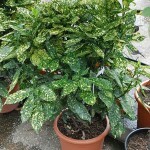 Aucuba japonica cv. ‘Variegata’ is the most popular cultivar of this species. Its leaves are heavily spotted with gold-coloured markings. This is a female clone, a similar male clone being named Aucuba japonica cv. ‘Maculata’. Aucuba japonica cv. 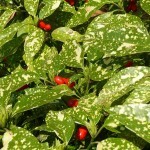 ‘Crotonifolia’ with at least half its mid-green leaf surface white or ivory spots. This variety is a female clone with somewhat larger leaves than standard species. Aucuba japonica cv. ‘Goldiena’ is a cultivar with a yellow centre and contrasting green margins. 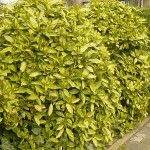 Dwarf Aucuba japonica cv. ‘Nana’ is compact, tight form and 8 x 8cm (3 x 3 inch), slow grower; foliage green with dusting of yellow. 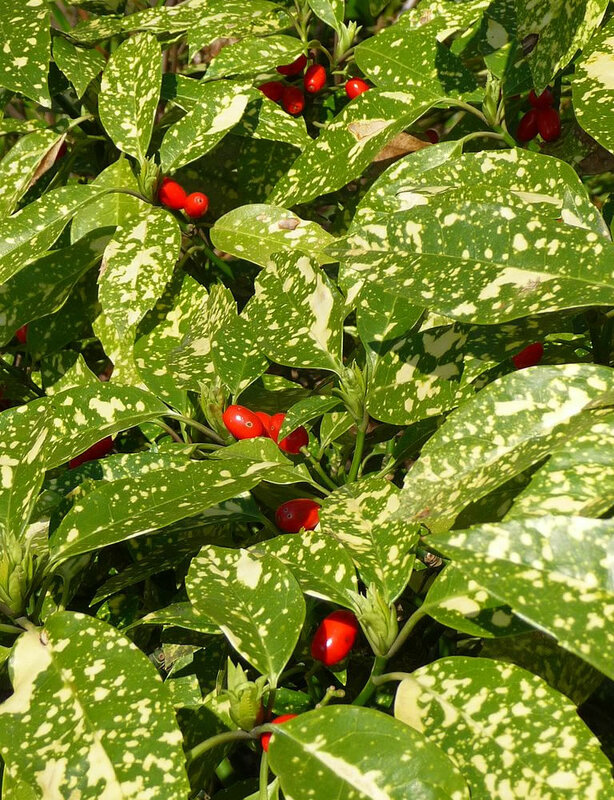 Toxicity: The fruit and leaves of Aucuba japonica are poisonous if ingested. Uses and display: Aucuba japonica is often seen as an informal hedge, but may also be grown indoors as a houseplant. In landscape, Aucuba japonica is cultivated as woody shrub, used for beds and borders, screening, hedge but can make a handsome specimen plant or focal point into the landscape. It is used for woodland garden styles, architectural patio and container plants for coastal locations.